Background: Analysis of different types of cancer such as breast, prostate and ovarian carcinomas have shown that protein kinase B is overexpressed, making this an important target in drug design studies. We use various models of structure-based drug design to investigate the PKB target screening half a million compound databases. Genetic algorithms and grid generation are the bases used in the docking procedures in order to select the best hits that exhibit chemical, electronic and structural characteristics that promote the appropriate interactions with the desired target. Toxicity is predicted using databases implemented in software that create models based on chemical structures taking into consideration the toxicophoric groups. A wide variety of pharmaceutical relevant properties is determined in order to make decisions about molecular suitability. The molecular dynamics simulations indicate that the inhibitor is stable in the docking site. After screening and analysis, we are able to suggest the most promising lead compound. Methods: The Structure-based virtual screening focuses on the three-dimensional information of the therapeutic target. 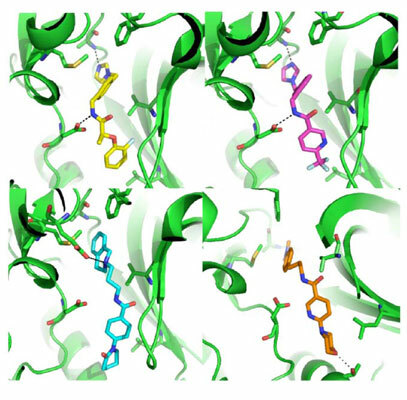 Docking procedures with the crystal structure of PKB inhibitor (PDB code 2X3D) in pH = 7.0 using GOLD 5.1 (www.ccdc.cam.ac.uk) and GLIDE 2014-3 (www.schrodinger.com) select the compounds that have the best interaction with the target to find new potential compounds, which are able to inhibit PKB. The study works with different databases, such as Maybridge, Zinc and Chembridge. Simulations of molecular dynamics with Discovery Studio (www.accelrys.com), ADME predictions with QikProp (www.schrodinger.com) and toxicity prediction with Derek (www.lhasalimited.com) were the next and final steps. Conclusion: Virtual screening strategies, such as docking have shown to be an important tool in the search for new promising drugs in cancer. ADME/Tox analysis allows discarding problematic inhibitors at an early stage of the Drug Discovery process. From a chemical universe of half a million compounds from several databases it was possible to select 4 top chemical structures with good inhibiting profile for PKB, with suitable ADME/Tox properties, using a low cost strategy made possible by structurebased virtual screening techniques. Keywords: Docking, molecular dynamics, ADME/Tox, cancer, protein kinase, structure-based drug design. Keywords:Docking, molecular dynamics, ADME/Tox, cancer, protein kinase, structure-based drug design. Abstract:Background: Analysis of different types of cancer such as breast, prostate and ovarian carcinomas have shown that protein kinase B is overexpressed, making this an important target in drug design studies. We use various models of structure-based drug design to investigate the PKB target screening half a million compound databases. Genetic algorithms and grid generation are the bases used in the docking procedures in order to select the best hits that exhibit chemical, electronic and structural characteristics that promote the appropriate interactions with the desired target. Toxicity is predicted using databases implemented in software that create models based on chemical structures taking into consideration the toxicophoric groups. A wide variety of pharmaceutical relevant properties is determined in order to make decisions about molecular suitability. The molecular dynamics simulations indicate that the inhibitor is stable in the docking site. After screening and analysis, we are able to suggest the most promising lead compound.